Corporeal Beast is a formidable foe – found within a cave in the Wilderness, to the East of the Graveyard of Shadows. 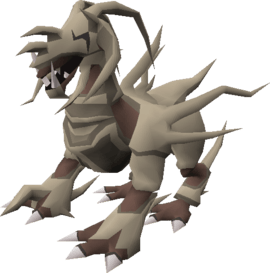 For a long time, the Corporeal Beast was considered the strongest monster in all of Runescape – practically impossible without a large team of well-equipped players. However, new weapons and more advanced tactics mean nowadays it is possible to solo Corp if you know what you’re doing. Corporeal Beast is a boss often ‘farmed’ by players looking to score one of the rarest drops in the game – the Elysian Sygil. The most common tactic to use at Corp is to use Elite Void armour combined with a Zamorakian Hasta – one of the only melee weapons effective at Corp. Depending on the size of your group, you will want to reduce the Corp’s massive defences by using multiple special attacks from either a Dragon Warhammer, a Bandos Godsword or an Arclight – or a combination of all three. Combining these special attacks is only possible by quickly teleporting to your Player-owned House to use a Special Restoration pool, then quickly teleporting back to Corp to land more special attacks. It can take around 20 minutes to successfully combine all of the special attacks but once complete, Corp’s stats will be so low you will be able to kill him easily without having to eat any food at all. The Void and Zamorakian Hasta method at Corporeal Beast is fairly simple – and as long as you have the numbers in your team you should be able to beat the Beast. First of all, it’s important that everyone in your team starts off the fight by using their Special Attacks. The order of Special Attacks should be as follows: Dragon Warhammer -> Arclight -> Bandos Godsword. The more special attacks you can use the better, and each successful hit will further increase the ease of the fight. During the fight, you should use the Protection from Magic prayer in combination with Piety. Keep your health above 50 at all times, and take extra care to not run under, or allow yourself to be trampled by Corp or you will take massive damage. The only other attack you need to watch out for is the Dark Energy Core. This core has a chance of spawning and will jump from player to player, dealing you damage and healing the Corporeal Beast for whatever damage is dealt. It is possible to avoid the core by moving at least two squares in any direction when you see it jumping towards you. In this manner, it will continuously bounce from player to player, and if everyone successfully dodges, you will take no damage and the Corporeal Beast will not heal. Another method to deal with the Dark Energy Core is to have a player attack it with a Crossbow in combination with Emerald Bolts(e). The special attack of these bolts will drastically reduce it’s ability to deal damage and to heal. The Dragon Warhammer can be swapped out with a Bandos Godsword or an Arclight.